No matter what activities you’ve got planned this winter, you need a jacket that can keep up with your active lifestyle without the added weight of a bulky coat. 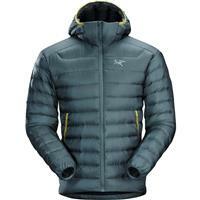 The Arc’teryx Cerium LT Hoody for men is designed with individuals exactly like you in mind. This down-insulated garment keeps you exceptionally warm and protects you against cold winds — especially considering its lightweight, streamlined design. The Cerium LT features articulated construction, allowing you to move freely. Even the hoody provides coverage without limiting your vision. Although made for cold, dry conditions, the Cerium LT does offer some moisture resistance. With its longer body length, you can be sure of a better fit. The Cerium LT Hoody is also perfect for traveling. Its lightweight design allows you to fold it up so it’s small and easy to pack. Then, when you’re ready to wear it, just shake it out into its original form. The ultimate mid layer that can stand alone as a jacket. Style and warmth with 850 down fill. Try this one on! Cons: The trim tailoring doesn't fit everyone! The Cerium LT jacket is one of the lightest, warmest insulated pieces available today. 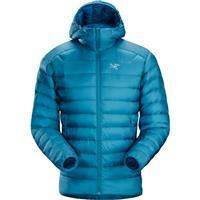 The 850 fill down retains warmth in the coldest of conditions, and the trim tailoring fits well beneath shell jackets. Washing down jackets is time consuming, but well worth the effort!